1914. Medlars were 2/- each. ROYAL A variety highly esteemed in England for its flavor and productiveness. (Goodman’s 1914) and productiveness. 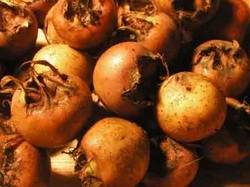 Medlars can be grafted onto wild Hawthorn plants (which can be transplanted to your garden when dormant in winter), or quince rootstocks which are easily grown from cuttings taken when dormant. Ideally, transplant Hawthorn plants to a nursery bed or to the intended final location where the medlar is to be grown a season before it's to be grafted. If it is to be grafted on site, it should be well watered for its first season. If it has a number of stems suitable for grafting, then graft them all and cut it back to one successful graft the following summer. It is asked that anyone intending to use this information in commercially published form ask the permission of Neil Barraclough, RMB 1477 STRATFORD 3862.